by Colette Featuring FUS-BC-508 CLICK TO DOWNLOAD THE PATTERN! by Burda Style Featuring KF-502 CLICK TO DOWNLOAD THE PATTERN! Make it Yourself! Keyhole Flutter Dress by Burda Style Featuring KF-500-1 CLICK TO DOWNLOAD THE PATTERN! by Violette Field Threads Made by Alexis Wright Featuring FUS-BC-503 & FUS-BC-500 CLICK TO DOWNLOAD THE PATTERN! by Petite Stitchery Made by Alison Brorsen Featuring KF-502 & FUS-BC-500 CLICK TO DOWNLOAD THE PATTERN! by Petite Stitchery Made by Laura Scaramella Featuring FUS-BC-508 & FUS-BC-500 CLICK TO DOWNLOAD THE PATTERN! by AGF Studio CLICK TO DOWNLOAD THE PATTERN! by AGF Studio CLICK TO DOWNLOAD THE FREE PATTERN! Make it Yourself! Bonnie Bucket Bag by Swoon Patterns Featuring FUS-BC-503 CLICK TO DOWNLOAD THE PATTERN! Make it Yourself! Dripping Paint Block by AGF Studio CLICK TO DOWNLOAD THE FREE PATTERN! by Violette Field Threads Made by Crystal Thoreson CLICK TO DOWNLOAD THE PATTERN! by Grainline Studio Made by Crystal Thoreson Featuring FUS-BC-503 CLICK TO DOWNLOAD THE PATTERN! Make it Yourself! Highlands Wrap Dress by Allie Olson Made by Alexis Wright Featuring KF-502 CLICK TO DOWNLOAD THE PATTERN! by Brindille & Twig Featuring KS-100 & KF-507 CLICK TO DOWNLOAD THE PATTERN! by Brindille & Twig Featuring KF-507 CLICK TO DOWNLOAD THE PATTERN! Make it Yourself! Flutter Sleeve Top by Brindille & Twig Featuring FUS-BC-506 CLICK TO SEE THE FREE TUTORIAL! by Violette Field Threads Made by Andrea Sandal Featuring FUS-BC-500 CLICK TO DOWNLOAD THE PATTERN! FUS-BC-500 GARDEN ROCKET BACHELORETTE by Bari J.
FUS-BC-506 PANACHE BACHELOR by Bari J.
KF-500-1 GARDEN ROCKET BACHELORETTE by Bari J.
by Petite Stitchery Made by Laura Scaramella Featuring KF-608 CLICK TO DOWNLOAD THE PATTERN! by Petite Stitchery Made by Laura Scaramella Featuring FUS-W-607 CLICK TO DOWNLOAD THE PATTERN! by AGF Studio Featuring FUS-W-602 CLICK TO DOWNLOAD THE FREE PATTERN! by Violette Field Threads Made by Alexis Wright Featuring FUS-W-608 CLICK TO DOWNLOAD THE PATTERN! by Sew Caroline Weekend Style Made by Alexis Wright Featuring FUS-W-609 CLICK TO BUY THE BOOK WITH THE PATTERN! by Burda Style Featuring R-600 CLICK TO DOWNLOAD THE PATTERN! Make it Yourself! Mystic Forest Pillow by AGF Studio Featuring FUS-W-604 & FUS-W-606 CLICK TO DOWNLOAD THE FREE PATTERN! by Ashley Hackshaw Made by Crystal Thoreson Featuring KF-609-1 CLICK TO DOWNLOAD THE FREE PATTERN! by Violette Field Threads Made by Crystal Thoreson Featuring FUS-W-606 CLICK TO DOWNLOAD THE PATTERN! Make it Yourself! Pruning Roses Blocks by AGF Studio CLICK TO DOWNLOAD THE FREE PATTERN! Pruning Roses Blocks by AGF Studio CLICK TO DOWNLOAD THE FREE PATTERN! Make it Yourself! Unconditional Quilt by AGF Studio CLICK TO DOWNLOAD THE FREE PATTERN! by Violette Field Threads Made by Alison Brorsen Featuring R-600 CLICK TO DOWNLOAD THE PATTERN! by Violette Field Threads Made by Andrea Sandal Featuring FUS-W-603 and R-600 CLICK TO DOWNLOAD THE PATTERN! by AGF Studio Featuring FUS-W-608 & FUS-W-609 CLICK TO DOWNLOAD THE FREE PATTERN! by Simple Life Made by Eleri Kerian Featuring FUS-W-603 & R-600 CLICK TO DOWNLOAD THE PATTERN! by Simplicity Featuring FUS-W-603 & KF-609-1 CLICK TO DOWNLOAD THE PATTERN! by Made by Me Patterns Featuring FUS-W-608 CLICK TO DOWNLOAD THE PATTERN! Make it Yourself! Princess Seam High-Low Dress with Pockets by Vogue Patterns Featuring KF-609-1 CLICK TO DOWNLOAD THE PATTERN! Make it Yourself! 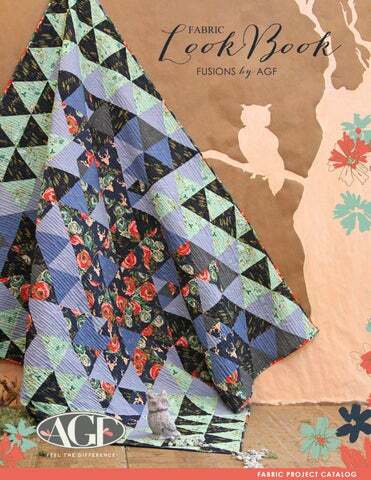 Diamond Outburst Table Runner by AGF Studio CLICK TO DOWNLOAD THE FREE PATTERN! by Burda Style Featuring FUS-W-609 CLICK TO DOWNLOAD THE PATTERN! FUS-W-600 PARADIS WOODLANDS by Bari J.
FUS-W-606 MISS THREAD WOODLANDS by Bari J.
R-600 PARADIS WOODLANDS by Bari J.
by Named Featuring R-708 CLICK TO DOWNLOAD THE PATTERN! by Simplicity Featuring KS-105 CLICK TO DOWNLOAD THE PATTERN! by Simplicity Featuring FUS-S-705 & FUS-S-707 CLICK TO DOWNLOAD THE PATTERN! Make it Yourself! Childs’ & Girls’ Top by Simplicity Featuring FUS-S-706 CLICK TO DOWNLOAD THE PATTERN! Make it Yourself! Willow Blooms Pillow by AGF Studio CLICK TO BUY THE BOOK WITH THE PATTERN! Make it Yourself! Zig-Zag Blooms Pillow by AGF Studio CLICK TO BUY THE BOOK WITH THE PATTERN! Impressions - Block 1 by AGF Studio CLICK TO DOWNLOAD THE FREE PATTERN! Impressions - Block 2 by AGF Studio CLICK TO DOWNLOAD THE FREE PATTERN! Made by AGF Studio CLICK TO DOWNLOAD THE FREE PATTERN! by Burda Style Featuring KF-708 CLICK TO DOWNLOAD THE PATTERN! by Violette Field Threads Made by Alexis Wright Featuring FUS-S-709 & R-708 CLICK TO DOWNLOAD THE PATTERN! by Violette Field Threads Made by Alison Brorsen Featuring KF-708 CLICK TO DOWNLOAD THE PATTERN! Make it Yourself! Thrive Cross Body Bag by AGF Studio Featuring FUS-S-709 CLICK TO DOWNLOAD THE FREE PATTERN! by AGF Studio Featuring FUS-S-701 & FUS-S-705 CLICK TO DOWNLOAD THE FREE TUTORIAL! by Petite Stitchery Made by Laura Scaramella CLICK TO DOWNLOAD THE PATTERN! by Couture Made Simple Made by Laura Scaramella Featuring FUS-S-709 & FUS-S-706 CLICK TO DOWNLOAD THE PATTERN! by Petite Stitchery Made by Laura Scaramella Featuring FUS-S-706, FUS-S-704 & FUS-S-705 CLICK TO DOWNLOAD THE PATTERN! by Sarah Gunn & Julie Starr Featuring KF-700 CLICK TO BUY THE BOOK WITH THE PATTERN! Make it Yourself! Miaâ&#x20AC;&#x2122;s Tieback Maxi Dress by Simple Life Made by Eleri Kerian Featuring FUS-S-700, FUS-S-701 & FUS-S-707 CLICK TO DOWNLOAD THE PATTERN! by Love Notions Featuring K-48511 CLICK TO DOWNLOAD THE PATTERN! FUS-S-704 JOY PLANTE SPICES by Bari J.
by A Beautiful Mess Featuring FUS-R-808 CLICK TO SEE THE FREE TUTORIAL! by Stitched by Crystal Featuring FUS-R-806 CLICK TO SEE THE FREE TUTORIAL! by Named Featuring FUS-R-809 & KF-801 CLICK TO DOWNLOAD THE PATTERN! Sweet Candy Quilt Blocks - 1 & 2 by AGF Studio CLICK TO DOWNLOAD THE FREE PATTERN! Sweet Candy Quilt Blocks - 3 & 4 by AGF Studio CLICK TO DOWNLOAD THE FREE PATTERN! by Violette Field Threads Made by Alexis Wright Featuring FUS-R-807 & FUS-R CLICK TODOWNLOAD THE PATTERN! Make it Yourself! Sarah Ann’s Cuff Leggings by Violette Field Threads Made by Eleri Kerian Featuring KF-801 CLICK TO DOWNLOAD THE PATTERN! by Violette Field Threads Made by Eleri Kerian Featuring KF-800 CLICK TO DOWNLOAD THE PATTERN! Make it Yourself! Vintage Triangle Coin Pouch by Sew 4 Home Featuring FUS-R-803 CLICK TO SEE THE FREE TUTORIAL! Surplice Flared Skirt Dress by Butterick Featuring KF-800 CLICK TO DOWNLOAD THE PATTERN! by Megan Nielsen Featuring KF-801 CLICK TO DOWNLOAD THE PATTERN! by Brindille & Twig Featuring FUS-R-802 CLICK TO DOWNLOAD THE PATTERN! by Life is Poppin CLICK TO SEE THE FREE TUTORIAL! Make it Yourself! Easy-to-Sew Sundress by Simplicity Featuring FUS-R-804 CLICK TO DOWNLOAD THE PATTERN! Meringue Placemats by AGF Studio CLICK TO DOWNLOAD THE FREE PATTERN! Morning Star Quilt Block by AGF Studio CLICK TO DOWNLOAD THE FREE PATTERN! CLICK TO WATCH THE FREE TUTORIAL! 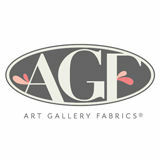 Looking for a place to purchase your favorite Art Gallery fabrics? Select your country from the map for a list of online stores in your area.